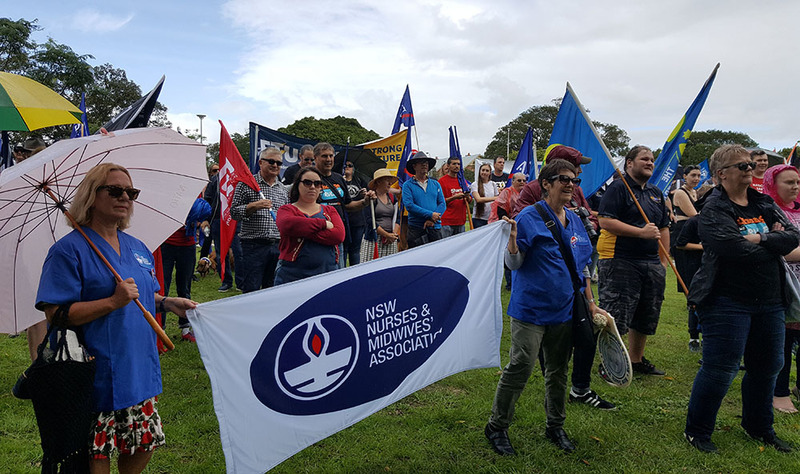 May Day in NSW is celebrated on different days in different cities enabling workers to join their mates in more than one march. In all three cities, the rally and marches focussed on the Australian Unions’ (ACTU) campaign to Change the Rules as well as the fight back against the ABCC’s attempt to prevent construction workers from flying the Eureka flag on worksites. Newcastle’s May Day started near Hamilton Station on Sunday, 29th April. Around 300 stalwart unionists, together with retired workers and their families gathered together at 10 am and about twenty minutes later marched through drenching rain chanting militant slogans such as “The workers united can never be defeated” and “When workers’ rights are under attack, what do we do? Stand up, fight back”. The march was decorated by many Eureka flags hoisted proudly by members of unions and political activists including some Newcastle Spirit of Eureka members. The Party’s May Day Special Issue of Vanguard was well-received and often read in part before the march began. The need to change the system as well as just the rules was particularly noted by some readers with comments such as “Spot on, mate” and “you’re not wrong there”. Many flyers from diverse political groups were handed out. Particular mention here should be made of Spirit of Eureka’s militant flyer “Eureka is the People’s flag”, condemning the bosses’ attack on construction workers’ right to fly the Eureka flag. Wollongong May Day rally and march was held on Saturday, 5th May. The night before there was a May Day Toast at the City Diggers' Club which helped to rally the troops for the march and bring in some much-needed funding for the South Coast Labor Council. As for Newcastle, on the Saturday, Party members handed out the Vanguard, which was received with the same enthusiasm on display at Newcastle. Once again, Spirit of Eureka members were also in evidence handing out their apposite flyer. At the rally, a large Eureka flag was hoisted and CFMEU delegate, Denis McNamara, spoke about the recent bosses’ attempts at intimidation. McNamara, as one who had encouraged the CFMEU to reclaim the flag for the people, had been hounded by the ABCC goons who followed him to every construction site he visited, twice demanding he face its inquisition. He refused and in April, he and eight workers were referred to the so-called “Fair Work Australia” because they wouldn’t remove flags from cranes. McNamara said that this intimidation wouldn’t stop workers from fighting for their democratic right to fly the flag. He said it was critical for the survival and victory of Australian workers, that we take to heart the oath sworn by the miners at Eureka. He then led the affirmation of that oath: “We swear by the Southern Cross to stand truly by each other and fight to defend our rights and liberties”. The march attracted about six hundred participants, eagerly chanting as in Newcastle, and equally determined to “Change the Rules”. The Vanguard analysis was keenly read by quite a few prior to marching. At the end of the march, a successful Party stall was set up selling literature and badges. 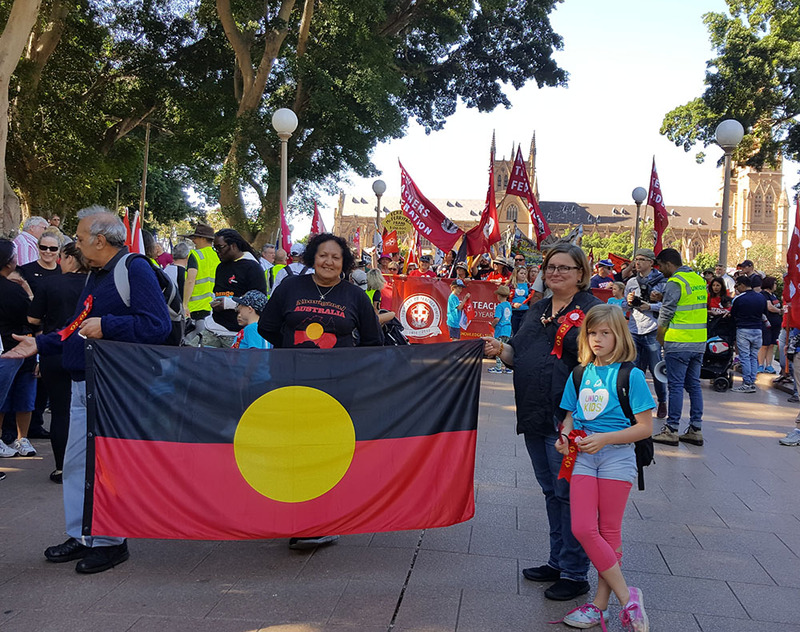 The Sydney May Day rally and march was held the day after Wollongong’s, on Sunday the 6th May and attracted many thousands of unionists and their families, as well as students and political activists—significantly more than last year. In Sydney, as in Newcastle and Wollongong, the speeches emphasised the need to Change the Rules and to fight back against the bosses’ victimisation, whatever the form it took. The Wollongong stall success was repeated in Sydney. Sydney Party members distributed hundreds of Vanguards, and Party literature and badges were again sold with success. There is no doubt the interest in Vanguard and in our stall showed a giant leap forward compared to previous years. Whilst the rallies in all three cities abounded in proletarian enthusiasm and determination, there was a noticeable lack in the number of young workers attending in Newcastle. Hopefully this will be addressed in future. The success of Vanguard and our Party literature bodes well for the development of proletarian consciousness in New South Wales.